Neck pain is the common problem experienced by many individuals at some point in their lives. A number of disorders and diseases, involving the tissues in the neck can lead to neck pain. The neck structure includes the neck muscles, arteries, veins, lymph glands, thyroid gland, parathyroid glands, oesophagus, larynx, and trachea. Disease or disorder of any of these structures can lead to neck pain. 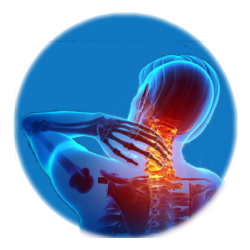 Conditions such as cervical spinal stenosis, myofascial pain, ankylosing spondylitis, cervical foraminal stenosis and spondylolisthesis can also be some of the reasons for neck pain. Common conditions causing neck pain are degenerative disc disease, neck strain, neck injury, herniated disc, pinched nerve. It also occurs due to spinal problems, stiffness of muscles in the neck and upper back. When to see a doctor for neck pain? Persists after several weeks of self-care. Radiates down your arms or legs.